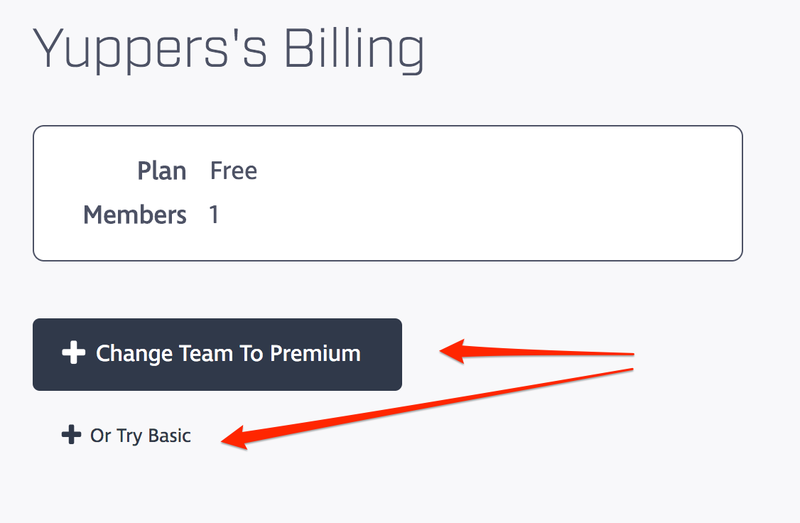 You can subscribe to a team plan from the Billing tab of your team page. Take special care to make note of the checkbox next to the Team owner has a subscription option — if you want access to the platform, you'll need to make sure this box is checked. Clicking either button will take you to the payment page, where you can choose between monthly or annual subscription plans for your team. Once you've entered your payment details, if you've checked the Team owner has a subscription box on the previous page, you will be billed immediately — this payment date will mark the first day of your team plan and all future additions to your team will be prorated based on the renewal date (if monthly, then your renewal date will be the same day the following month; if yearly, then your team renewal date would be the same day the following year). ⓘ For teams with 10+ team members, please reach out to our Support team before you subscribe —we'll need to manually apply the team discount to your subscription. Speaking of proration, how does that work? To put it simply, you're billed for each team member based on the amount of time left on your plan at the point of signup. Let's say that you choose to subscribe to the premium monthly plan on 6/3 — you choose to have an account, so you're billed the $49 immediately, and 7/3 becomes your team plan's renewal date. Your teammate, Joe, decides to join the team. You send him an invite, which he accepts on 6/14. You are automatically billed for Joe's subscription, prorated on the amount of time left on the plan until the renewal date. Our system automatically calculates this to the second, but for brevity's sake, let's just say there are 19 days left until the plan is slated to renew (7/3) — this means that you'd be paying $49/30 * 19 = ~$31 for Joe to come onboard. When you remove someone from the team mid-billing cycle, you are not refunded for the time they have not used. They lose access, and you lose the seat — this behavior holds true for both monthly and annual subscriptions. However, in the case someone on the team does end up leaving, there's a better way to ensure you're getting the maximum value out of your subscription (particularly if you're on an annual plan). These "licenses" are transferable, but the process will need a bit of legwork from our Support team — please shoot us an email or a message via the (?) at the top of the DQ interface and we'd be more than happy to take the lead!